Beautiful woodblock print by the artist Toyohara Kunichika (豊原国周) depicting the princess Kazu, full name Kazunomiya Chikako Naishinno (和宮親子内親王), wife of fourteenth shogun Tokugawa Iemochi (徳川家茂). 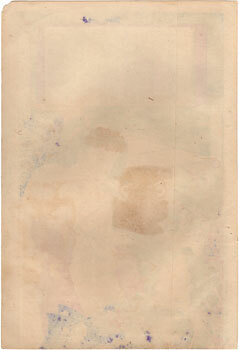 The princess was known as an excellent calligrapher and she was also highly regarded as a waka (和歌) poet. 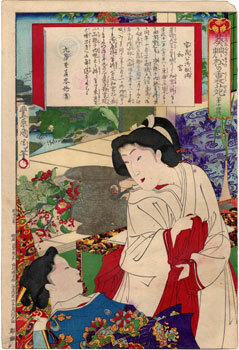 The work, made in 1879 by the publisher Takegawa Seikichi (武川清吉), is taken from the series "The Backyard of Pines and Malvaceae" (葵艸松の裏苑). Remarkable, in the upper right corner, the decoration of the title depicting the triple hollyhock (三葉葵), that is the emblem of the Tokugawa clan (徳川氏). 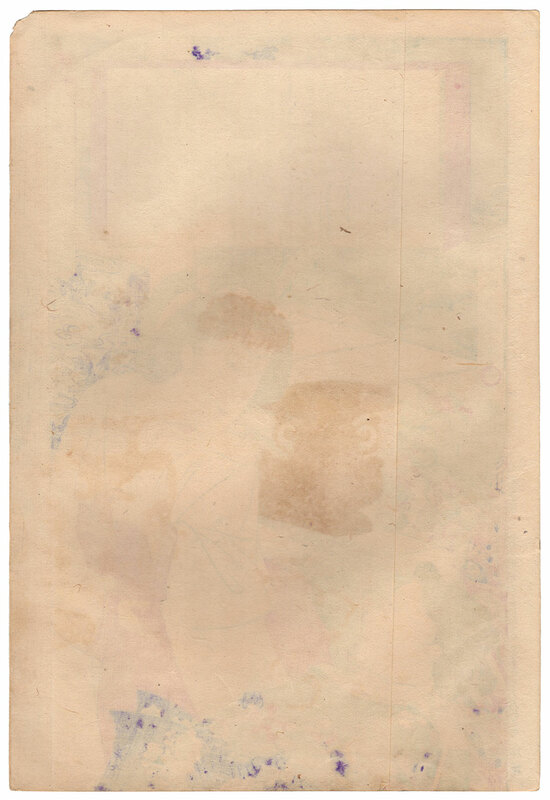 The print on Japanese washi paper (和紙), despite the proper signs of aging and a small tear in the upper right corner, is in good general condition, thanks also to a relining carried out on the back.